For the past two years, some of cycling’s best racers have battled it out in some of the world’s most extreme weather conditions. The third edition of the Arctic Race kicked off on Thursday, seeing 130 professional riders battle rugged terrain, buffeting winds and even reindeer some 350 kilometres north of the Arctic Circle in a race organised by the powers behind the Tour de France. Well, since you inquire, the likes of Sagan, Bouhanni, Costa and Landa are all up here in Harstad – the third largest town in northern Norway. Admittedly that’s not Peter, Nacer and Rui, but their less-illustrious brothers Juraj, Rayane and Mario, plus a Norwegian youngster who shares the same surname as Astana’s Spanish climber Mikel Landa. And yet I shouldn’t sell the four-day race short. It may be a place for up-and-coming (or contractual) siblings to earn their crust and justify their presence on their more-feted brothers’ teams, but it also attracts some real stars. Norwegian duo Alexander Kristoff (Katusha) and Edvald Boasson Hagen (MTN-Qhubeka) are tipped to go head-to-head this year – although they should look over their shoulders at a raft of contenders that include last week’s Tour of Burgos winner Rein Taaramae (Astana), eighth-place Tour de France finisher Mathias Frank (IAM) and in-form Belgian Ben Hermans (BMC). Thor Hushovd – winner of the inaugural Arctic Race in 2013 and now an event ambassador following his retirement last year – has labelled former teammate Ben Hermans and Swiss all-rounder Frank as his favourites. Saturday’s third stage finishes with a “short but steep” climb to the Alpine-style ski village of Malselv (3.8kilometres at 7.8per cent) which “may be too hard” for local favourites Kristoff and Boasson Hagen. Nevertheless, the pair got off to a flying start with a fiercely contested one-two in Thursday’s opening stage. Speaking to us journalists ahead of the race in a classroom in the Harstad cultural centre that doubles as the race media centre, Hushovd says the northern location, the mixed terrain, fjords, mountains and fervent fans makes the Arctic Race unique in the professional calendar. As does “riding between the reindeers, which is a bit special”. Key to the success of any race is support from the locals, and this is something the Arctic Race has in buckets. “There are lots of events in the south and west coast of Norway but up here they had nothing,” says Hushovd, who bowed out of professional cycling last year shortly after being denied two Arctic victories by compatriot and heir apparent Kristoff. That I can vouch for, having spent an hour of the day preceding the opening stage alongside Bryan Coquard (Europcar) and Rein Taaramae (Astana) in a helicopter scouting the race route. It was the bequiffed French sprinter Coquard’s first experience with a chopper – although his excitement was outdone by Colombian climber Jose Serpa, who documented his entire aerial experience with the help of a selfie stick (the smile underneath his trademark moustache wilted not once). For Zak Dempster – one of four Australians taking part – racing in the Arctic offers “a great opportunity to see somewhere different” (the other Australians taking a northern bow are BMC’s Campbell Flakemore, and Novo Nordisk duo James Glasspool and Chris Williams). “It’s a weird landscape – so beautiful, with the black clouds closing in and all the small fishing villages. If we weren’t doing this race it’s an area we’d never get to see,” the Bora-Argon 18 rider tells me outside his team hotel ahead of the race. Last year, Dempster’s bungled discarding of a bidon resulted in a mini pile-up for which, mortified, he took full responsibility. This year, the 27-year-old is keen to put a tough Tour de France behind him by helping Ireland’s Sam Bennett make a splash in the sprints. So far, so good: Bennett made light work of the punchy rise to the finish in Harstad to finish behind Kristoff and Boasson Hagen and take a solid third place, and with it the white jersey, on Thursday. Don’t let Kristoff’s ubiquity on the podium here in the Arctic make you think these ‘flat’ stages are mere showpiece criteriums for the 28-year-old home star. Before his Tour de France wobble, Kristoff was the in-form sprinter of the season, so his presence on the podium here is logical. That said, his latest win was no given, and achieved despite Katusha being one man down, with teams of six riders making the Arctic Race much harder to control. Besides, the very fact that Kristoff denied Hushovd a win in the final stage last year at Tromso underlines that there’s no culture of gift-giving here in the Arctic – even to out-going champions. So, back to the question of why the Arctic Race exists, and the answer is quite simple: because ASO are behind it. 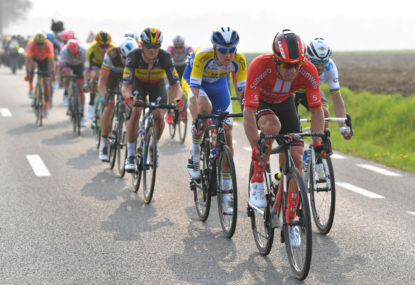 Without the organisers of the Tour de France, the Vuelta a Espana, Paris-Roubaix, Paris-Nice and another dozen or so mainstream World Tour events, the Arctic Race would struggle. But ASO’s backing gives the race both credibility and clout – and should ensure that it’s still around even when Kristoff starts to wilt. Last year, when Christian Prudhomme himself visited the Arctic Race, the Tour grand fromage told us reporters how ASO’s newest event (besides the Tour de Yorkshire) was a “pioneering” race which would help develop cycling by “pushing back the boundaries of the sport and reaching larger audiences”. Of course, there are obstacles. 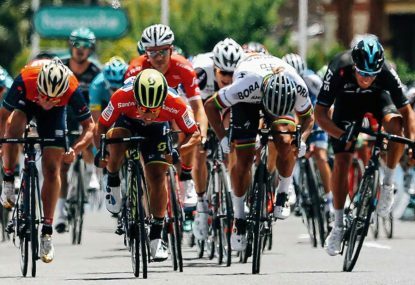 The race’s position between both the Tour and the Vuelta, and alongside other World Tour events such as the Eneco Tour, means there will always be a struggle to attract the biggest names in cycling. This is partly why five of the 22 teams are Continental Norwegian outfits filled with young home-grown talent (making the daily battle to make the break quite feisty). 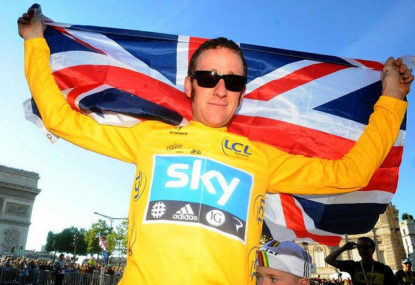 But the novelty value of racing in the Arctic – as alluded to by Hushovd and Dempster – cannot be underestimated. Having spoken to many other riders out here, there is a general feeling of excitement amid the peloton. 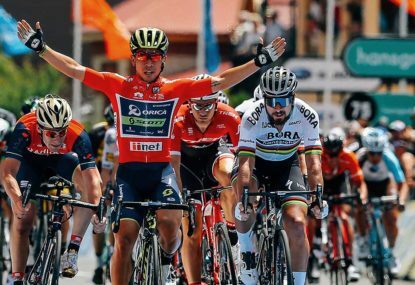 And while it’s not exactly a holiday, there is the same excitable vibe up here in the north as there is on the other side of the globe at the Tour Down Under (just replace the kangaroo signs for ones depicting reindeer). Less than 24 hours before the 2015 Arctic Race got under way it was announced that chief sponsor Statoil had signed on for another three years, securing the future of the race until 2018. Given the prestige of the race in Norway, there’s a steady queue of local sponsors hoping to get a slice of the pie as well. For instance, Norway’s fish farmers have stepped in to sponsor the king of the mountains jersey, promising whomever reaches the summit of Friday’s key climb (the Lavangseidet) 500 kilograms of salmon. On Thursday’s opening stage, one of those home-grown Norwegian riders – Vegard Stake Laengen of Team Joker – won himself €1000 worth of smoked salmon. 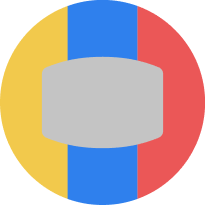 With ASO in the driving seat, Eurosport showing each stage live, a slew of Norwegian politicians and ministers giving the race their backing, and enough fishy promises to feed the five thousand, fans are going to see a lot more of the Arctic fjords and Norwegian flags in the years to come. 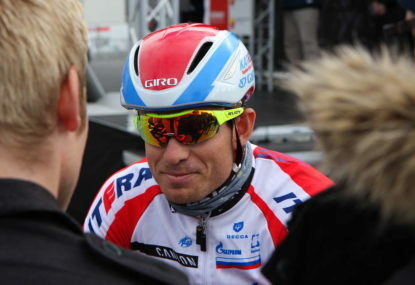 Perhaps someone other than Alexander Kristoff may even win a stage, too.